The Calcasieu Parish Coroner’s Office unveiled a portable cooling system Thursday that would allow them to set up an on-site morgue during an emergency. The system is a set of refrigerated mats that go in a body bag, along with the body, to lower the temperature to around 38 degrees. “It’s not designed for long-term storage, just to help a coroner’s office or hospital get organized during and after an emergency,” said Zeb Johnson, lead investigator with the Calcasieu Coroner’s Office. Johnson said the coroner’s office can hold 25 to 30 bodies and the system would double their capacity. Some benefits to getting the body temperature lowered as quickly as possible include stopping post-mortem purging of bodily fluids and a deterioration of body structure and fingerprints, said Michael Richardson, CEO of Mortuary Response Solutions, the company that developed the mats. Richardson emphasized that the system did not stop decomposition; it just slows the process. Johnson, who also runs a local funeral home, said getting the body in the least decomposed state is always helpful when embalming. The system was purchased with a $24,000 grant from U.S. Department of Health and Hospitals and is available to any coroner’s office in Southwest Louisiana. 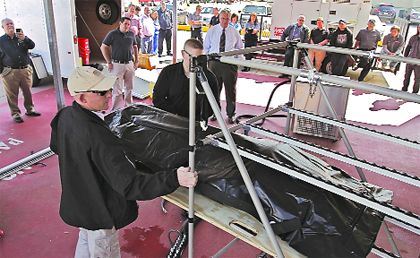 Also Thursday, inside the coroner’s office, coroners and public health officials from the region took part in a mock drill to test the new portable morgue. The mock emergency was a tornado touching down in Beauregard Parish and 75 to 100 bodies had to be salvaged, said Liz Harmon, coordinator for Region 4 and 5’s Hospital Preparedness Program. “We are testing how local hospitals will handle a large number of bodies coming into their emergency rooms and what kind of coordination they have with their coroner’s offices,” Harmon said. Calcasieu parish officials on Tuesday, presented a redistricting map filled with minor shifts in district lines. “We focused on maintaining distinct communities, while still following federal laws,’’ said Kade Cole, the attorney who oversaw the redistricting. The parish population according to the 2010 census is 192,768. Majority minority districts, mandated by the Voting Rights Act, were slightly shifted south into central Lake Charles. Each district would have a black voter population over 60 percent. The second largest change was residents moving southwest in the parish, causing changes in Districts 6 and 7, which stretch from the airport to Ward Line Road. The largest overall population increase was District 8 in south Lake Charles, which is the Barbe school district. The Gillis area was moved from District 1 with Moss Bluff to District 10 with LeBleu Settlement. A northern section of Westlake, would be moved from District 3 to District 14, with the rest of the city. Far west districts that include the Vinton and Starks area were unchanged. For an April 30 election, which is a local option election on Mojito Point casino resort, the polling places will be listed on the Police Jury website. The Police Jury voting on the map on April 7. Officials then send the map to the Department of Justice for approval, which takes about 120 days to review. Coyote Awareness Campaign from Vanessa Deggins on Vimeo. On Tuesday, a coyote awareness plan that features a website and telephone hotline was unveiled to Calcasieu Parish residents. “Since Dec. 1, 2010, Calcasieu Parish Animal Services has received 75 calls about coyotes, with 95 percent being sightings,” said Tiffany Gardner, assistant director. He said that may be because people in the north are used to seeing them. Gardner said removing attractants and hazing are the most-effective ways to deal with nearby coyote populations. Hazing is making loud noises, throwing sticks or spraying coyotes with a water when they come near. Gardner said this is for coyotes that have become used to human contact. “Studies have shown these methods worked in large cities like Denver, Colo., and parts of British Columbia, Canada,” Gardner said. She said residents had asked about killing programs, but every study she has seen not only show they don’t work, but may contribute to an increased coyote population. “We want to make sure people know who to call and what to do when they see a coyote,” Gardner said. In reaching a formal agreement to house Beauregard Parish juvenile offenders, Calcasieu Parish officials said key reforms have allowed them to help out a neighbor. He said Beauregard officials will have to adhere to Calcasieu Parish admission standards. All juvenile offenders are screened, with mostly violent offenders being admitted. “Many years ago, and still in some centers today, if a child is picked up for shoplifting, (he or she) might be placed in a detention center with a violent felon,” Bolin said. In Calcasieu Parish, options include electronic monitoring, home detention and the evening reporting center. Young violators report to or are taken to the center after school; there they can do homework and get needed treatment. They are taken home at 9 p.m.
“We work hard to keep the kids who shouldn’t be here at home, and that’s how our numbers stay low,” Bolin said. He said housing juveniles out of parish is common because there are 17 centers across the state, which has 64 parishes. The Beauregard Police Jury will pay Calcasieu the state rate of $105 per day per juvenile. On average, juveniles from out of parish stay less than a week. “It’s not a big moneymaker, but it offsets all costs and does not cut into services for our kids,” Bolin said. He said he conducted training classes for Beauregard Parish law enforcers to explain how juveniles who committed certain crimes are handled based on reforms Calcasieu Parish has put in place.